Pacific Northwest College of Art, a small private college at the forefront of creative design, needed a new space to anchor its growing campus in downtown Portland. The college found what it needed by renovating one of Portland’s historic gems—the city’s original main post office built in 1918. 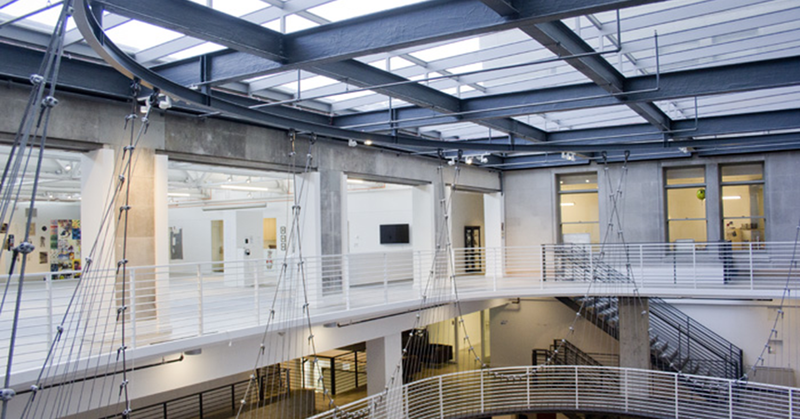 The new Arlene and Harold Schnitzer Center for Art and Design showcases PNCA’s vision and entrepreneurship through the imaginative repurposing of a government building into an inspiring, sustainable and energy-efficient campus hub. Students and faculty now work in studios and classrooms lit entirely with daylight and LEDs. The original skylights, which had been covered for 40 years, are now an integral part of the design, illuminating nearly every working space. The center is kept comfortable with an HVAC system that uses variable refrigerant flow and dedicated outside air—one of the first in Portland. Renewable resources provide 35 percent of the building’s energy. Originally designed by San Francisco architect Lewis Parsons Hobart, who also designed Grace Cathedral in San Francisco, the center is listed on the National Register of Historic Places. The 145,000-square-foot renovation preserves the building’s exterior and marble-lined corridors, but includes major interior improvements. Through its use of daylight, LEDs, low-flow water fixtures, an efficient HVAC system and a significant supply of renewable energy, the Arlene and Harold Schnitzer Center for Art and Design has received LEED® Platinum certification. The center was also recognized with Top Honors in Renovation in the Daily Journal of Commerce TopProjects Award. It was a finalist for the Mayor’s Award from the American Institute of Architects Portland. PNCA received $288,914 in cash incentives from Energy Trust for design assistance, energy modeling, energy-efficient equipment and building commissioning. As a customer of Portland General Electric and NW Natural, the college expects to save 813,700 kilowatt hours of electricity and 3,200 therms of natural gas each year—equivalent to $64,700 in annual energy costs savings.